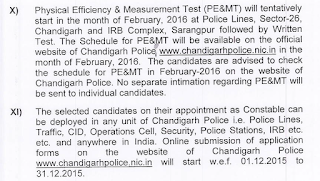 Chandigarh Police Constable Admit card 2016 www.chandigarhpolice.nic.in - Chandigarh Administration Police Department is going to conduct Physical test for Constable posts. Earlier Chandigarh Police Department had completed the application process for recruitment to 520 posts of Constable in Chandigarh Police. For the selection of these posts Chandigarh Police will conduct physical test (PE&MT) followed by written exam as a part of the selection process. At first Physical Test (PE&MT) will be conducted as per the dates mentioned here. Chandigarh Police is going to conduct physical exam for Constable posts (Check notice below).Notice: Candidates are hereby informed that no Admit Card will be issued by Chandigarh Police to the candidates. Their application number generated at the time of applying online is sufficient and whenever they are called for PE&MT, they should bring copy of their application. The completed form will serve as the Admit Card for the Physical Endurance & Measurement Test (PE&MT). No separate admit cards will be issued or sent to the candidates. For any enquiry candidates may contact the Chandigarh Police office by E-mail to prectpol.chd@nic.in or by SMS on Mobile no. 8284888777 from Monday to Friday, between 9 A.M to 5 P.M.
Chandigarh Police Constable Physical Test Date - March 2016 (tentative). 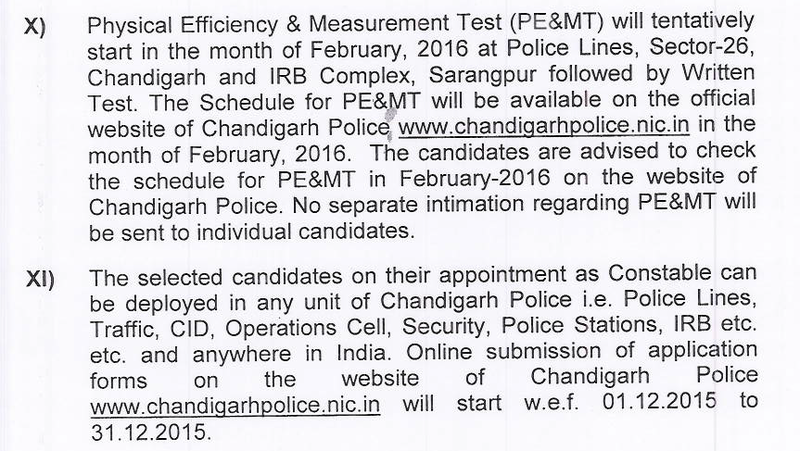 The detailed schedule for PE&MT might be available on the official website of Chandigarh Police www.chandigarhpolice.nic.in in February 2016. You will be updated about the schedule of PE&MT as soon as it got released. The selection for these posts is to be done on the basis of Physical Endurance & Measurement Test (PE&MT) followed by Written Examination. The admit cards news will be updated here. Pay Scale - Selected candidates will be posted in 10300-34800 GP 3200 scale. The Physical Efficiency and Measurement Test (PE&MT) will be held in March 2016 (Tentative). The exact dates will be released later. Venue of Chandigarh Police Constable Physical Test - PE and MT will be carried out at Police lines, Sector 26, Chandigarh and IRB complex, Sarangpur. Admit card details will be updated here regularly.